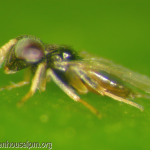 Aphelinus abdominalis is a parasitoid wasp that parasitizes larger aphid species such as Potato aphid and Foxglove aphid, and the adults also kill aphids by feeding on them. Aphelinus works slower than Aphidius species, but has a much longer adult life span. Aphelinus are small wasps approximately 3mm long with a short body and short antennae. The have a black head and thorax, and a yellow abdomen, and resemble Encarsia formosa but are more than 3x larger. Aphelinus have a long adult life span which can last several weeks under appropriate conditions. The females lay 5-10 eggs per day throughout their lifecycle. 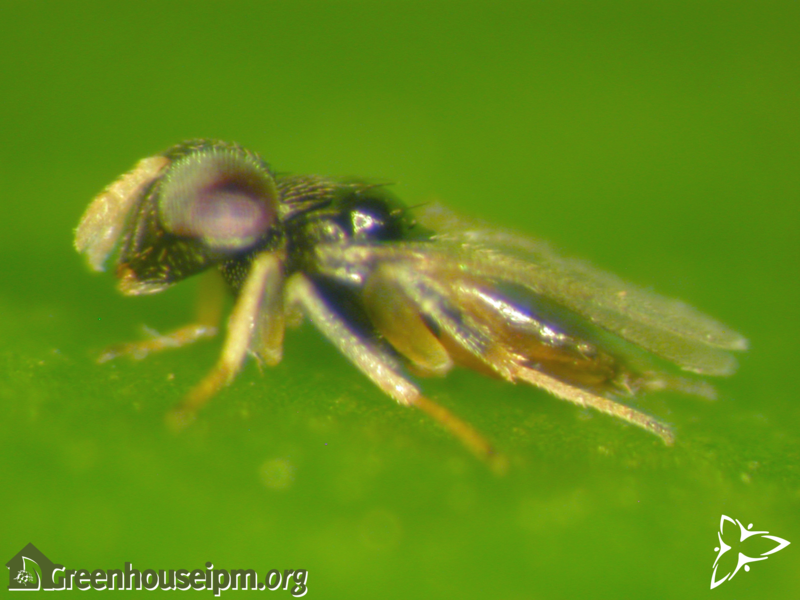 The female lays a single egg inside the body of a aphid (typically a 2nd or 3rd instar nymph), and the egg hatches and feeds on the living body of the aphid, eventually killing it. A dead, parasitized aphid is known as a “mummy; the mummies of Aphelinus are black in colour. The fully developed parasitoid chews a hole in the outer casing of the mummy and emerges and begins searching for new aphids to parasitize. Development from egg to adult takes approximately 2-3 weeks. Adult Aphelinus also kill aphids by feeding on them. Aphelinus are not very strong fliers and should therefore be placed near aphid hot spots for maximum efficacy. Aphelinus work best when released either preventatively or when aphids first appear in the crop. Refer to the Quality Assurance of Biocontrol Products to determine the quality of the Aphelinus at receipt at the greenhouse. Aphelinus are sensitive to many pesticides. Please consult the Quick Reference Guide to Registered Pesticides made by OMAFRA for compatibility information of products registered in Canada. Koppert and Biobest also have pesticide compatibility information listed on their websites. Designed by Two Blonde Chicks Inc.